Running approximately 20 miles (32 km) from Van Nuys Boulevard in Sherman Oaks to Figueroa Street at the northern edge of Downtown Los Angeles, it is one of the major thoroughfares in the San Fernando Valley. It runs through the heart of the Valley and is home to many of Southern California’s major entertainment companies, passing both the Warner Bros. and Walt Disney Studios in Burbank. Then it enters West Glendale and continues as a major thoroughfare until it intersects with Victory Boulevard and Sonora Avenue. It then continues as the major thoroughfare through Griffith Park, though its name changes as it passes through the park, first to Zoo Drive, then Crystal Springs Drive, and then Griffith Park Drive, before becoming Riverside Drive again as it leaves the park at its southeastern boundary. Riverside Drive then continues east and south along the Los Angeles River, passing just north of the Silver Lake Reservoir. It runs along the northern edge of Elysian Park, passing north of Dodger Stadium before becoming Figueroa Street near the northern edge of Downtown. Metro Local lines 96 and 155 operate on Riverside Drive. Communities are listed west to east, or north to south. Places are listed west to east, or north to south. The drive hosted part of the 50 km walk athletic event near Griffith Park for the 1932 Summer Olympics. ^ "Los Angeles River Tour". Archived from the original on 2007-10-16. ^ "Notre Dame High School". ^ "Forest Lawn Memorial Park: Hollywood Hills". Archived from the original on 2012-07-31. ^ "Warner Bros. Studios Facilities". ^ "The Walt Disney Studios". ^ "Walt Disney Animation Studios". 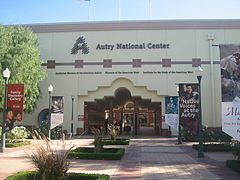 ^ "Los Angeles Equestrian Center". Archived from the original on 2008-02-22. ^ "About the Silver Lake Community". ^ "The Official Site of the Los Angeles Dodgers: Dodger Stadium Ballpark". ^ 1932 Summer Olympics official report. p. 86.